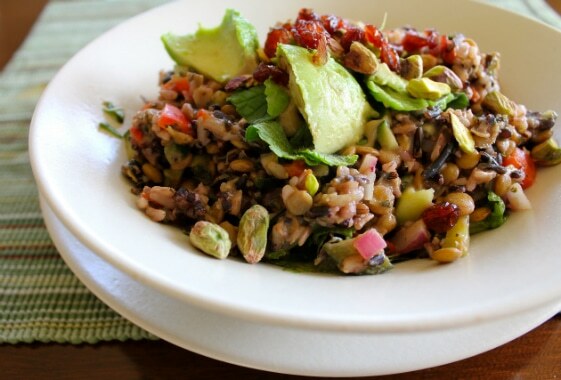 Here is a Lemony Brown Rice & Lentil Salad that is nutrient-dense, plant-based, and so easy to make! I had some leftover lentils from my Baked Lentil Collard Wraps so I made them into a salad. I also had extra brown rice from another dish so I used that, too. I’ve made this salad before, but not with brown rice. This type of salad is so easy to prepare yet tastes so gourmet! 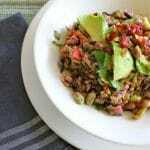 I honestly didn’t miss the oil and the avocado and nuts give it a boost of healthy fat. After mixing the lentils and rice together, I just added “the goodies” including: chopped onions, bell pepper, cucumber, garlic, ground black pepper and mint. I topped the salad with avocado, dried cranberries, mint and pistachios. The dressing was lemon juice…that’s it! Combine all ingredients in a large bowl and stir. Pour lemon juice on top and stir again. 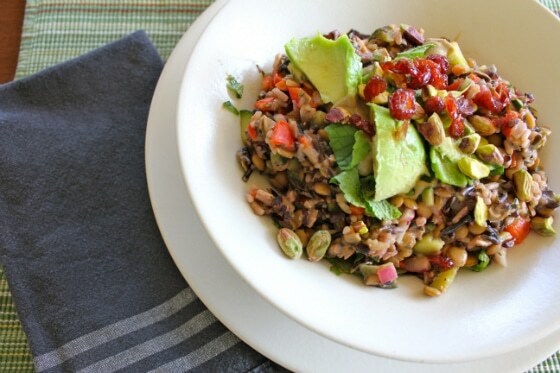 Top with avocado, cranberries and pistachios. Also, remember when I revealed my new secret ingredient in my Anti-Cancer Green Breakfast Smoothie? Hint: it was frozen broccoli. I have another one! Don’t knock it til you’ve tried it. It’s really good, the bok choy is so mild I couldn’t even taste it, even with my sensitive super-taster taste buds. I’m taking my next to last science class this semester. I take microbiology in the spring and then I’m finished (with science)! Congratulations! Right now I’m in a condensed anatomy and physiology I and II and it is KILLER. So ready for the break! Thanks Sara! Congrats to you too on your A&P, that’s a hard one! That salad looks soooooo good! I can’t wait to try my own version of it. 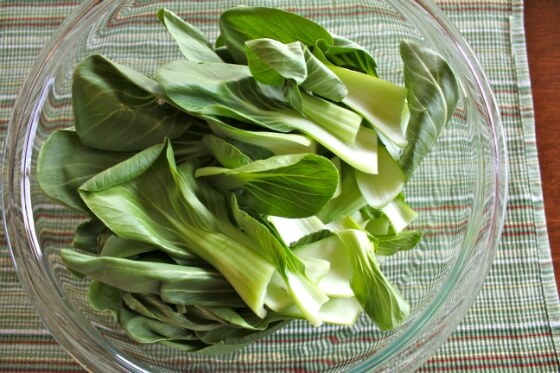 And I never thought of using bok choy in my smoothie–I like to mix it up with my greens. Thanks for the suggestion. Thanks Joy! 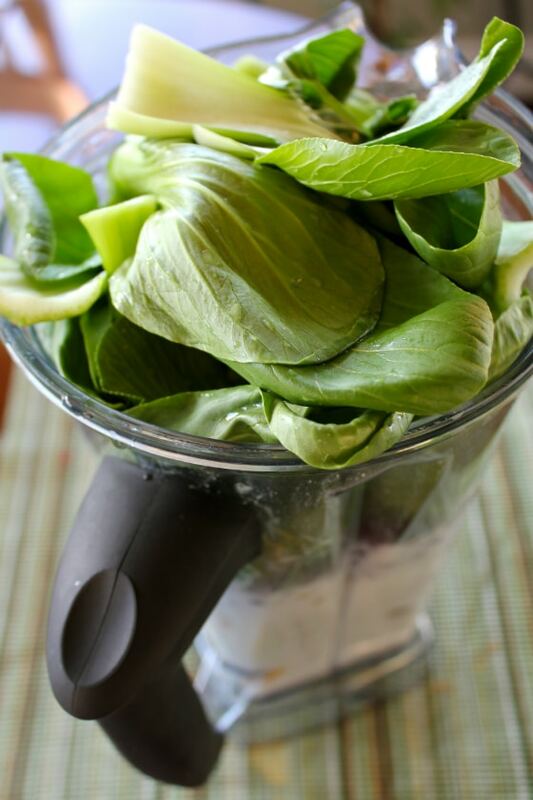 Let me know if you try using the bok choy in a smoothie, I love it. The salad looks fantastic! Can’t beat a warm salad in the winter. Swab light switches and the toilet flusher! 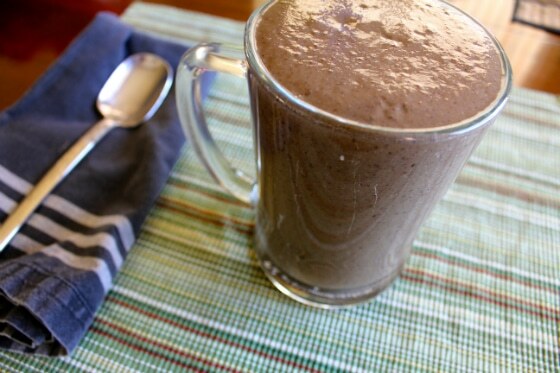 I know this post is from a while ago but we just tried this recipe and it is SO YUMMY! It’s made the “must have” list of recipes each week. Crunchy, chewy, sweet, tangy all at once! Hi Carrie! 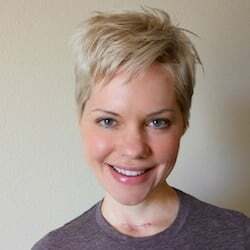 I love your site, and your recipes. Thanks for all the great content! Hi Alexis! Thank you so much for the heads up. I just changed to a new ad company and I’ve e-mailed my contact to let him know about the leather ad. If we can’t work it out, I’ll switch companies. I very much appreciate you letting me know; that’s not cool with me. Of course! Can’t wait to try this recipe, btw! Looks so delish!! Have a question as a fellow vegetarian…..what are your thoughts on all the bad press for brown rice. Am torn because my family and I eat a lot of brown rice, i use brown rice syrup at times to sweeten my kids baked goods or puddings. They love rice noodles, cereal, cakes, teh works. Curious what others think of arsenic issue in brown rice. Hi Sarah! Thanks for the comment. This is a great question concerning the arsenic levels in brown rice. To be honest, since the report came out, I have been cutting back on my rice consumption and trying to alternate more whole grains like quinoa, amaranth, wild rice, buckwheat, oats, etc. I am definitely concerned about the arsenic contamination.